This classic 1880s Victorian has remained in the hands of the current family for over 60 years. Its stately corner location provides abundant natural light from the east and south. 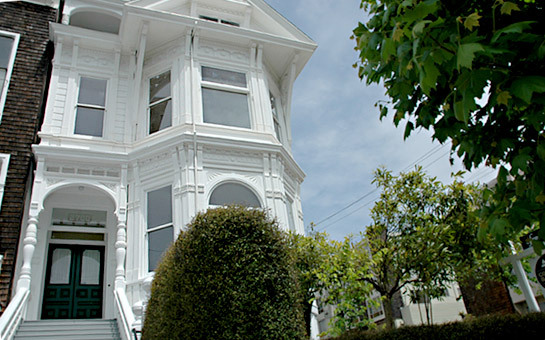 The architecture of the house can be described as an asymmetrical Italianate stick Victorian. It's A-frame roof houses a striking triangular pediment framing a wood-carved starburst on the front façade. A similar but smaller gabled pediment containing the starburst motif faces east. The house retains much of the original architectural details. It has excellent 'bones' and awaits restoration and modernization under the deft eye and taste of the new owner. The LIVING ROOM with fireplace looks out to the small, sunny front garden. The formal DINING ROOM with fireplace can seat a large dinner party. The bright and spacious KITCHEN with pantry awaits the new owner's custom installation. A MAID'S ROOM or AT-HOME OFFICE and large LAUNDRY/UTILITY ROOM are located at the rear of the house. The hallway runs almost the length of the house along the west wall and contains a small WC with shower, closets and rear access. Ascend the handsome wood carved staircase with lamp post newel to mid-landing which features the original colorful art glass tryptich and bench seating. The front MASTER BEDROOM with corner fireplace enjoys abundant natural light; it has a large walk-in closet and adjoining full BATH. Two east facing BEDROOMS with adjoining wash room. WC off hallway. A rear BEDROOM can also be used as a STUDY.